Mark Alexander is a British-born artist who lives and works in Berlin. He employs idiosyncratic designs for his frames, based on traditional models but always used in unconventional ways, and has become increasingly enthusiastic about their meaning for his work over the course of his many exhibitions. The most recent of these, open at the Gemäldegalerie until mid-July 2016, demonstrates this with great bravura. He is interviewed here by Jack Wakefield. 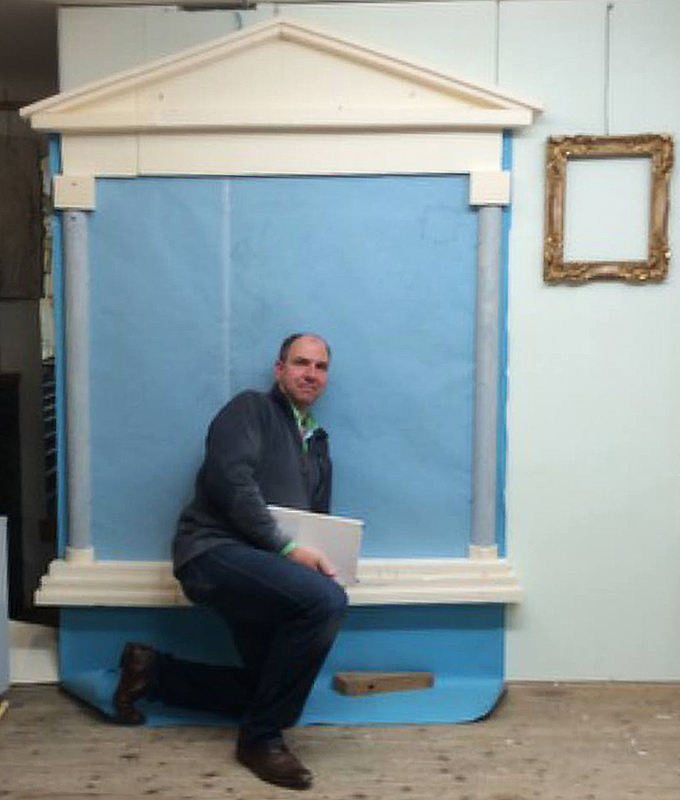 Jack Wakefield: How long have you thought of framing as integral to your practice? 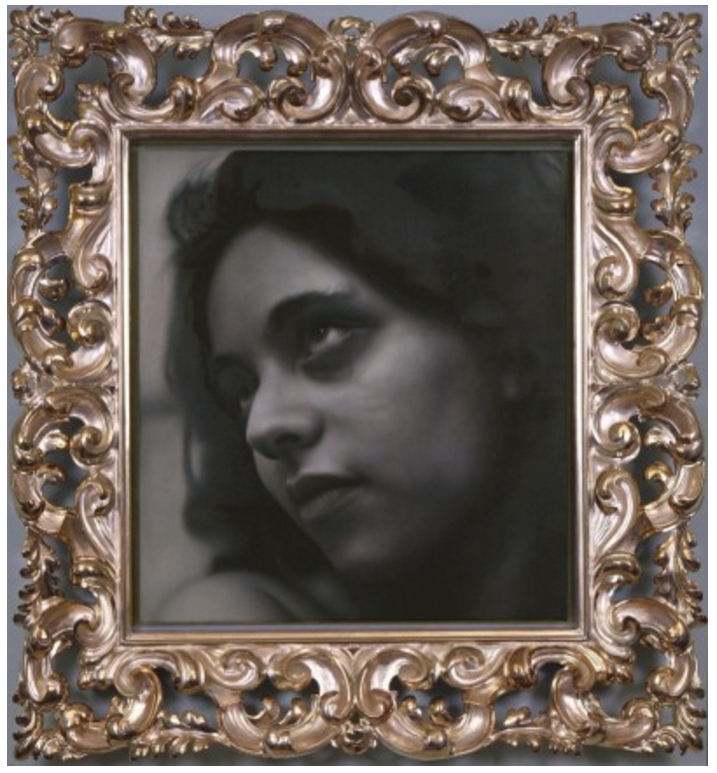 Mark Alexander: I think I always have thought of frames as integral to my practice. Clearly, while they frame and protect an object they also give it a presence and authority. On one hand I have – at a very basic level – associated frames with a way of finishing the picture, but on the other I think that they add greatly to the significance and drama of the work. I have also been inspired by, for instance, reliquaries and the way that they are housed. I can remember seeing a Damien Hirst show at Boundary Road…. obviously he uses a kind of vestigial frame too, and that’s something that I could see in the contemporary art world – the use of framing devices – and I found it very interesting. The shark vitrine is a good example. JW: It’s clear that the shark vitrine is a type of frame, but it isn’t just a frame – it’s actually part of the work. Are your frames part of the work? Is that always the case? 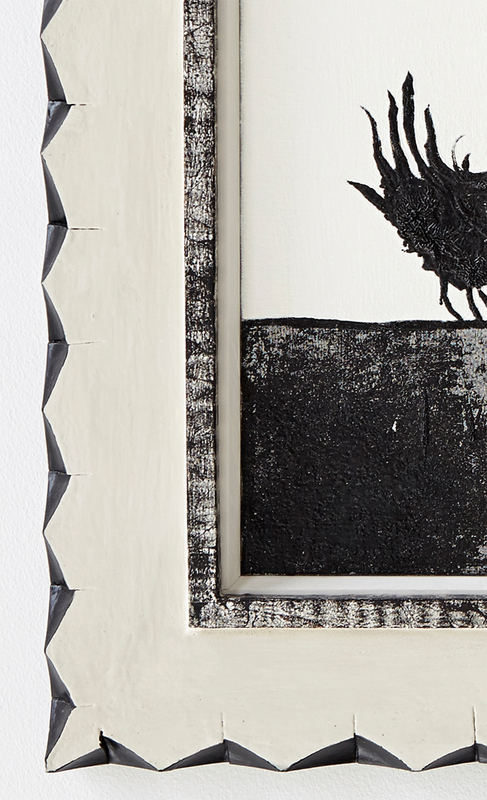 MA: The frames have always been part of the work – I have always seen them as integral to it. 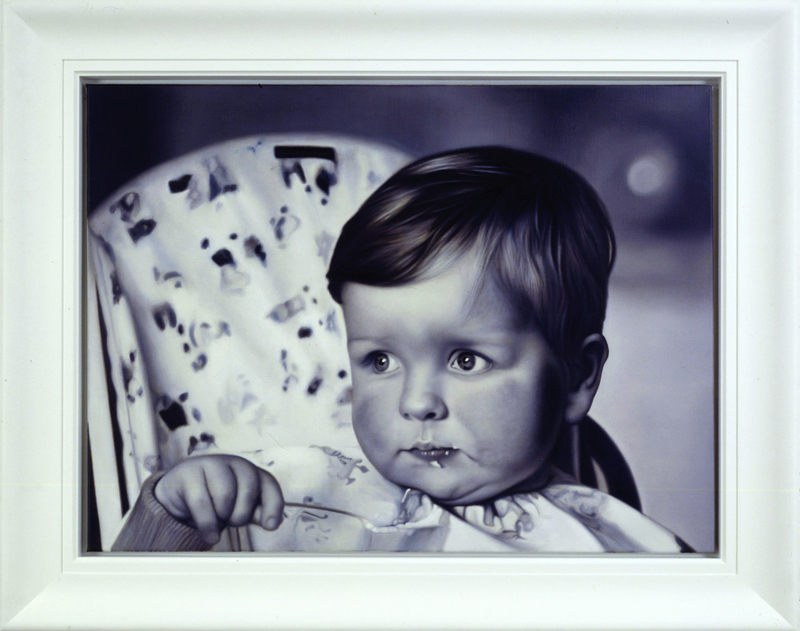 For example, the first paintings I produced were a series of photorealistic baby pictures, and I devised a frame for them that would look rather like a piece of baby furniture, with soft white edges – almost a play on Damian Hirst’s white vitrines. So I have always seen the frame as an integral element, and definitely as a part of the message. MA: The Jasmin frame wasn’t, as you say, part of the original idea. In fact that portrait originally had a very good simple gilded frame on it which I designed in collaboration with the London framemaker, John Jones. It was only later that I put it into that scrolling gilt Florentine frame. That one was catalyzed by a different set of circumstances, and I’m not sure that it really works on that picture, to be honest. I mean, I would regard it as a completely different conception. It was a risk and I’m not sure that it totally worked out. JW: When you make your paintings, you make your paintings. You don’t outsource the manufacture. But when it comes to framing you go to professionals. 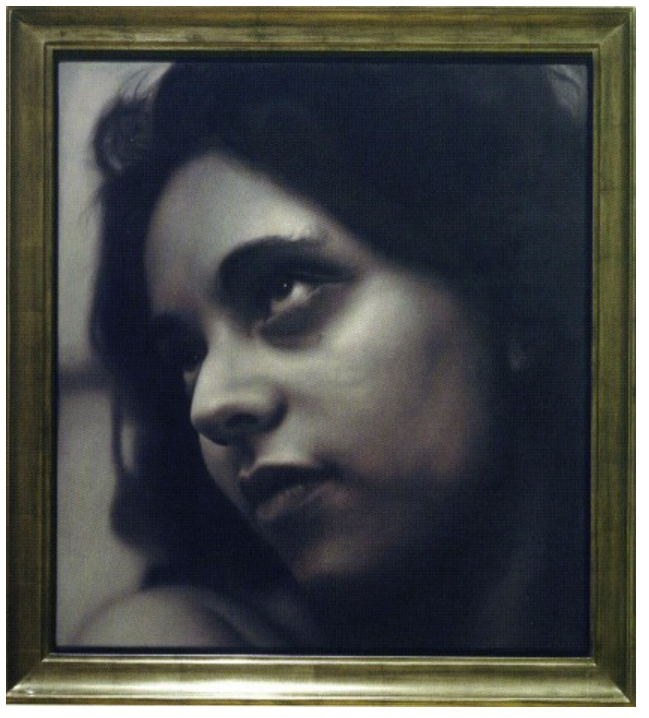 Given that the frame is an intimate part of the whole process, how does that affect it? 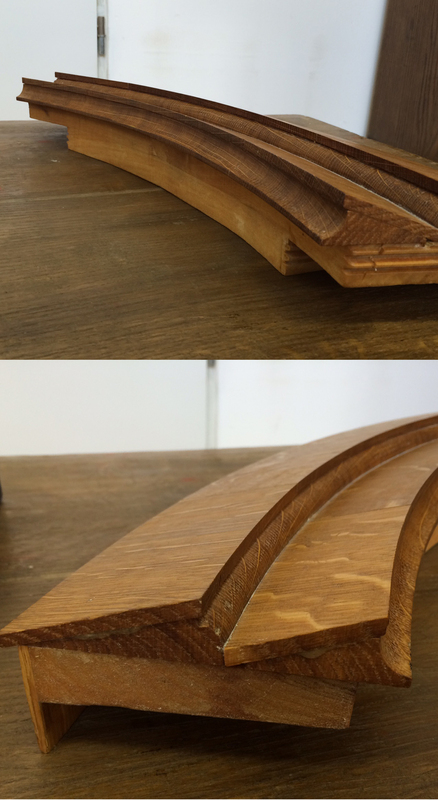 Is the creation of the frame a collaboration, or do you just put all your trust in a particular framemaker? MA: I first became seriously enthusiastic about frames in Berlin in 2004, when I got to know the frame dealer Olaf Lemke, who introduced me to many different kinds of antique patterns – and I started to understand the quality of those frames. It began to be something I wanted myself; those surfaces, the various woods. I realized that with those frames that I could actually reinforce some of the messages I was trying to express. The first body of frames that I had made was for a series of paintings called The blacker Gachet; these were ebonised black frames with a ripple moulding. There’s an element of Stanley Kubrick’s monolith in them that I really like. 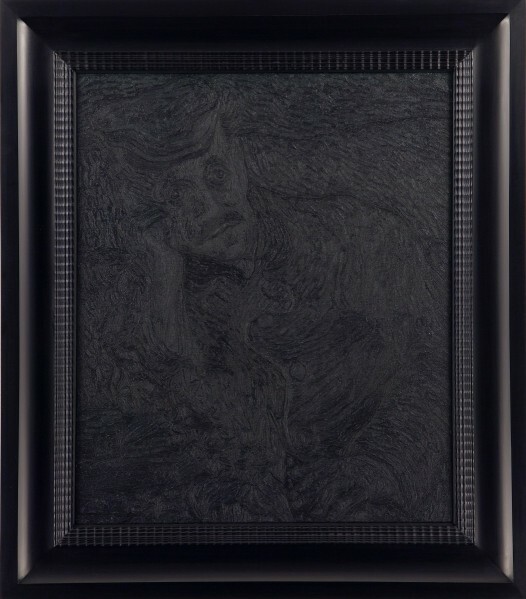 The paintings were primarily a solid black, and when a black Dutch frame was put onto one of them, and it was glazed, the whole thing became a sort of sealed unit: something that you couldn’t touch and you couldn’t change, and so it seemed to be almost threatening because you couldn’t get close to it, it was just there. And it looked as though it couldn’t escape from this rather strong black frame with laminated museum glass. That was all part of the theatre of it; clearly the paintings didn’t need laminated museum glass, but as they sit on a gallery wall they seem as if they’re not going to give up their message. Really for me it reinforces the intensity of what I was trying to infuse into the work from the first germ of the idea – and therefore the frame was always going to play an inevitable rôle in the result. With another body of work, Black sunflowers, inspired by Van Gogh’s Sunflowers, I took a basic 17th century Spanish-style frame and applied a motif from one of those sunflower leaves to it, carving a jagged edge around the contour. It looked rather brutal – half Brancusi and half Picasso – with a rather primitive element, but also rather a threatening one. This design invests the paintings with a sense of the uncanny, I think. In both these cases the frames really do seem to send out a jarring, threatening message. JW: So you would say that the frame augments the meaning of the painting even when it obscures the painting, like with the museum glass you were talking about? MA: That’s an interesting point. 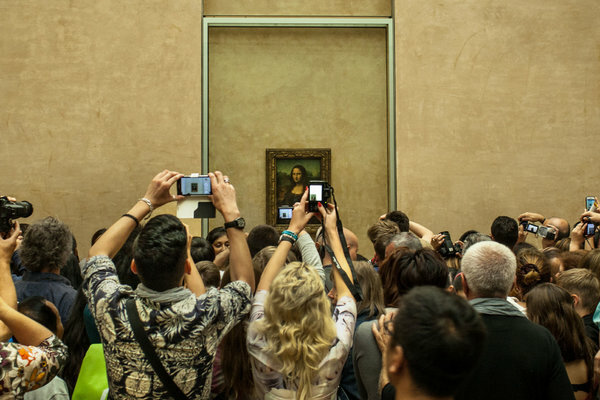 Paintings are representations, but they’re also objects: the way we perceive some famous paintings, anyway, causes them to become objects, like the Mona Lisa behind its glass cage . I think that what I am trying to say is that I regard paintings as vessels for messages, and when they are framed, and especially when they’re glazed, this alters or diffuses the message in some way; so that for me, when the surface of the work is slightly obscured or blurred, whilst it is still possible to see that there’s some kind of message, that message is made more mysterious. That feature of being unable to see with complete clarity: you’re able to create from it an element of desire, the desire to see and to understand. I like that. I think that if you can hold the viewer’s attention in this modern world, that’s a very important thing. Because all too often people take things in at one glance, and that’s not something I want. I’m not in it so that they can understand my work in a single glance: I want them to think about my work. I think that I can buy some time – make them look harder – if I use a bit of glass, to put it flippantly. I also want to implicate the viewer in the work, so capturing his or her reflection became an important consideration. 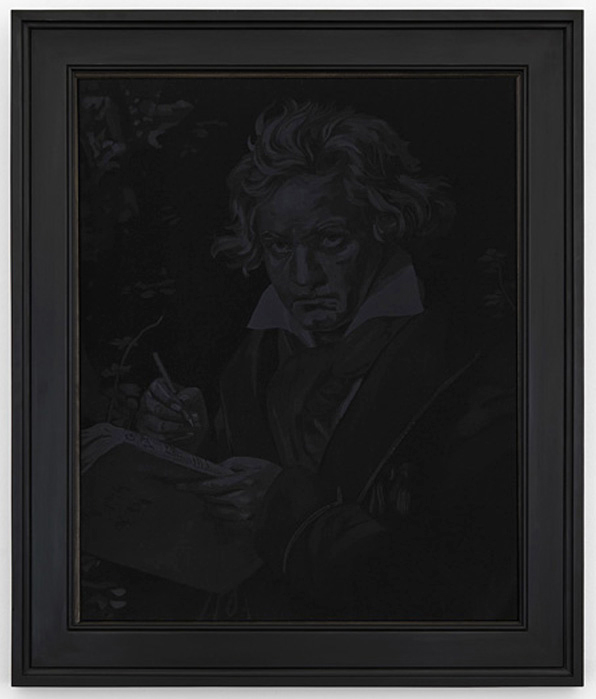 I was asked by the Beethoven Society to paint an official work for the 250th anniversary of Beethoven’s birth in 2020, so I painted a completely black portrait which was also glazed. It was vital, both to me and to some of the scholars in Beethoven House, that the spectator could see him- or herself within the portrait. It’s often been said that when you listen to Beethoven, you start to think about yourself rather than the music, and I tried to mirror that in the tension between seeing yourself at one moment reflected in the glass, and then looking through your reflection to see Beethoven. And Beethoven was often quite difficult to see… but then his music can also be quite difficult. Some of his late quartets are extraordinarily complex, which is why I think the added complexity of the reflection works so well in this case. Thus you have the strong image of the black square (da da da dum…), and then the difficulty of seeing and understanding him, and of comprehending his form behind the glass. I am always attempting in this way to draw the viewers in, to hold their attention and to implicate them in the work. Those are aspects of my work which are really important to me. JW: Do you want to say something about the work you are making at the moment and then something about the frame you are making for it? How did you make the frame, where did the design come from? MA: I have recently been absorbed in the process of making an aedicular frame for a project that has engaged me in total for 16 years so far. In about 2000, when I was in the Berlin Gemäldegalerie, I saw [Rembrandt’s] Jacob wrestling with the angel and I was very moved by it; however, while I was walking away I thought, who do we wrestle with now? And the only answer I could come up with was – ourselves. So I envisaged a great golden sun with my face at the centre. I had a nice little image of myself as a child looking out into the distance which I liked, so I just used that – it’s not really meant to be a self-portrait: it could have been any child. The rest of it – the shield on which the face is set – is based on a 3D model that I had, and I created it in the workshop of Bernhard Lankers, the woodcarver, which is how we became friends. I made the model in his workshop quite rapidly, and then spent the next 15 years trying to paint it to make it look as though it were a 3D golden object – the most beautiful gold you have ever seen; as though it was made of celestial gold. It has had various incarnations: it’s been a painting, and it ended up as giant screenprints, which I thought were quite successful. Now, finally, I’ve finished a version that I am very happy with (The golden wonder): I feel that at last it does look like real gold, and so I decided to make a suitable frame for it – a Greek frame, because the painting itself references Minoan images and decorative motifs. Realizing the painting had been something of a drama; a lot of people had tried to help with this work, which never quite seemed to materialize, and I decided to realize the drama as well, in the form of an aedicular frame with Corinthian columns to house the painting. This took quite a bit of working out… gold works best when it’s next to – well, certainly not a white background: white works least effectively – next, preferably, to a grey background; so I decided to paint the whole thing grey when it was finished. The frame was also a way of protecting the painting, and reinforcing its mysterious nature… and also, after taking so long to produce it, and involving so many people, the whole project has a rather operatic air to it, and therefore creating this grand Greek temple to house it I thought very appropriate. It does, in fact, work very well with the painting. The whole object is implicit with the vision of a golden statue in a Greek temple, lit by sunlight coming through the doors, and reflected from a pool of water; and even beyond this, there is a feeling (although this wasn’t in my mind when I painted it) that the image itself exudes some element of an ancient neurosis. The frame was made in the workshop of Bernhard Lankers by his assistant Luise Harfmann under his guidance, after we built the model together out of plasticine. A famous art dealer called Heiner Bastian who helped me get the project under weigh, and even provided a wonderful studio for me to make this work, had put me in contact with Bernhard. Bernhard was rather too busy with other projects at the time to make the model, and after several visits it was clear I actually wanted to make it myself – so he provided space in his workshop and gave me constant advice. 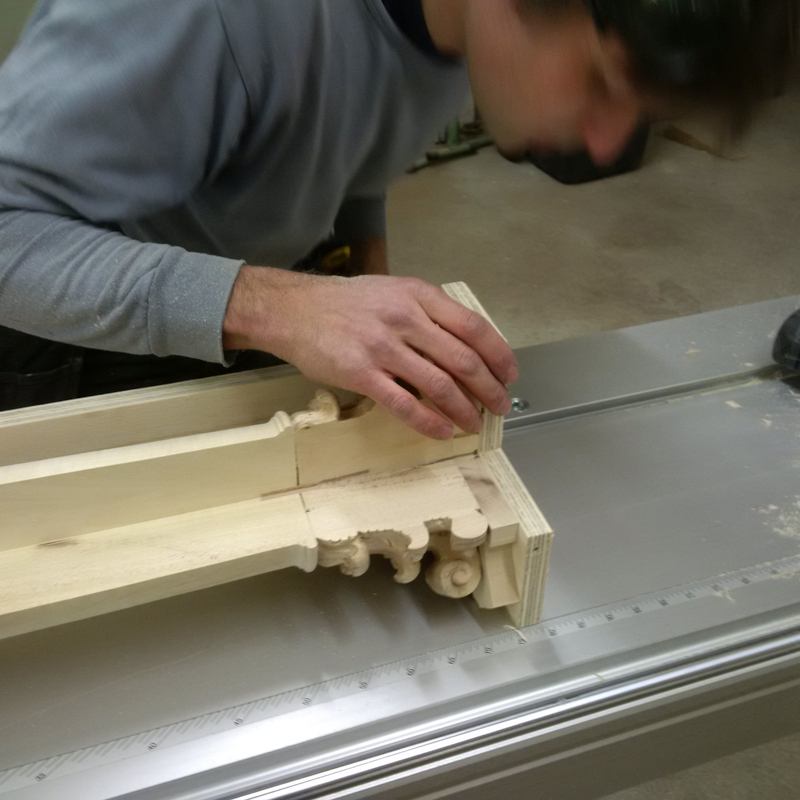 The finished frame is made of limewood, and adheres closely in nearly every detail to the Corinthian order. The capitals may be slightly more Baroque than perhaps they should be, but that’s something I wanted – I don’t know why, but it just feels right. JW: Do you think your taste for the Baroque comes from spending time in Germany or was it there anyway? MA: Actually, it may well have been partly inspired from my involvement in Bernhard’s workshop; Bernhard is a specialist in Rococo and Baroque designs. But I think that it also came, perhaps, from the gardens of the Palazzo Orsini in Bomarzo, which is a kind of apocalyptic vision of the end of the Renaissance – everything is topsy turvy and chaotic, there are monsters, and an aura of doom. Therefore, rather than the capitals being classically correct, they’re slightly sagging and engorged, giving a very subtle hint of decadence and the sense of an ending. That’s what I’m after; I hope that’s the impression that emerges – it’s what this work is all about. Perhaps, though, not a final ending; perhaps a metamorphosis. What I’m trying to say is that whilst things are always changing, I think that each generation feels that they are changing in ways beyond their control, and that’s what I’ve tried to interpret through this image. JW: You outsource the classical authenticity to the framer… to Bernhard and his assistant? And how else do you think of yourself as outsourcing the framing? MA: Luise and Bernhard are used to working in accordance with the conventional rules for the classical orders. Bernhard and I had made a model of exactly the way I felt that the frame should look, while Luise was very keen to start from the antique model and then to make conscious changes to it – knowing what we were altering and why, rather than just spontaneously changing them without too much thought. So she produced a set of drawings with all the classical elements of the frame returned to their antecedents, and I had to make my own conscious changes to these. I think that I had changed the pitch of the roof – she put restored it in the drawings, and then we had to work out properly by how many degrees we were going to change it, to give it a higher peak. She did the same thing with the columns, and elsewhere with the classical proportions of the whole thing. She was very keen that I should change the parts I wanted with consideration and by working them out on paper, rather changing them haphazardly, by eye. I found that very interesting. It was quite strange, and I thought it was rather unnecessary; however, it’s actually been really fascinating to see exactly how I was changing the ancient model, and in what ways, even if I didn’t know exactly why I wanted it to be different…. It was also a little bit like that with the frame for Jasmin. I wanted to exaggerate it – to give it a hint of Jeff Koons, as it were. 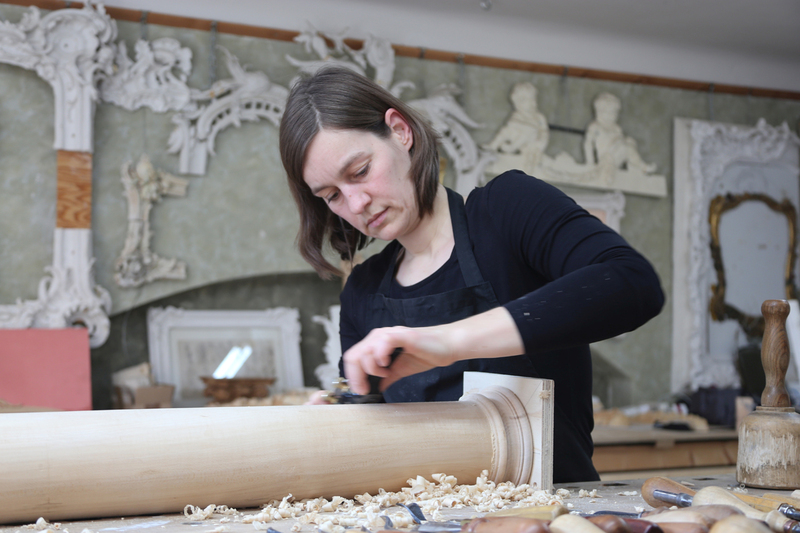 Normally when you carve a frame and then gesso it for gilding, the gesso is very skilfully laid on in one layer, so you shouldn’t even need to sand it down, in theory, or to alter anything about its surface. That’s the way I understand things. But I was very keen to put the gesso on myself, and then I asked the gilder to sand it down thoroughly – much more than is usual – to cause a wilful tension within the frame, so that instead of the gesso falling fluidly over the wood it was barely there on much of the surface, and the edges of the carving were really crisp. 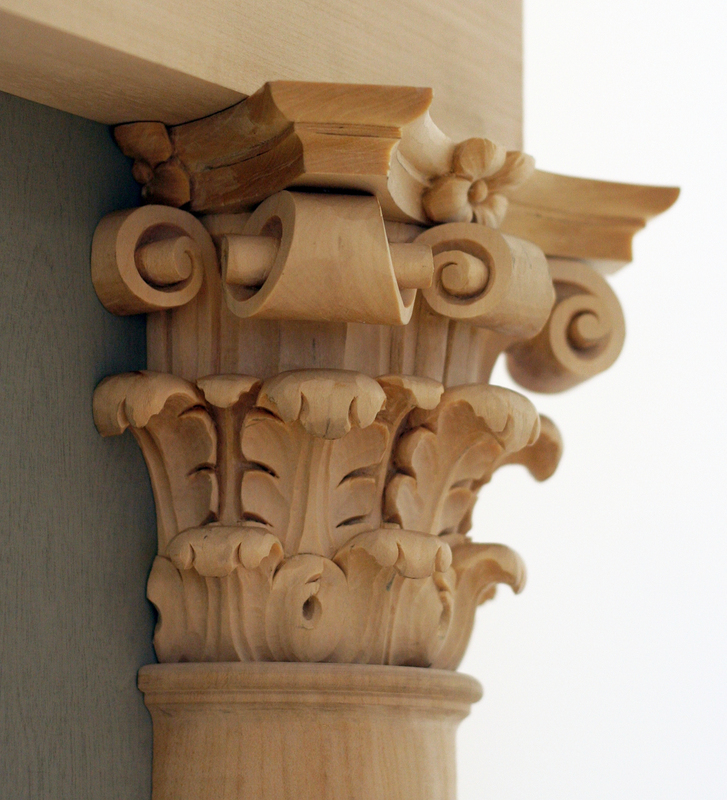 I think you can tell that the finish has been slightly tweaked, and that the carving looks almost engineered. It is quite interesting that when you work with craftsmen like these, and you ask them to change things, you have got to have good reasons and it must work, otherwise they don’t really feel comfortable doing it. There’s no point working with such people if you are going to change the rules they work by, recklessly, because their skills and knowledge have been built up over centuries, and you might as well not bother if you’re not going to heed them. And that’s also fascinating – and it’s why I enjoy such a collaboration: it’s a bit like working with history; and if you change it you’re changing – well, you’re not changing history, but you’re certainly… altering, in some sense, the spaces between the molecules. Carved frames are therefore for me one means of locating the uncanny in the undertow of the timeless. Working within these ancient traditions gives me a way in to this primitive flow of thought and feeling and creation. It’s not quite right to say I’m outsourcing their production, either. I’m very hands-on – almost too much so. I love the touch of the wood, and I’m there in the workshop all the time, spending hours making my intentions clear and also, as I said, tweaking the way the frame looks. 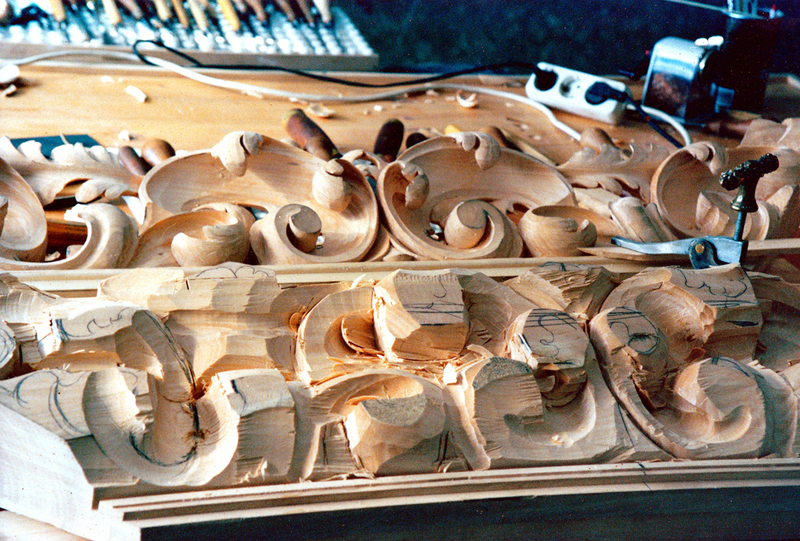 When a carver is working on something for me, I’m certainly on the spot, or in very close contact, so although I don’t make these things myself I am heavily involved. 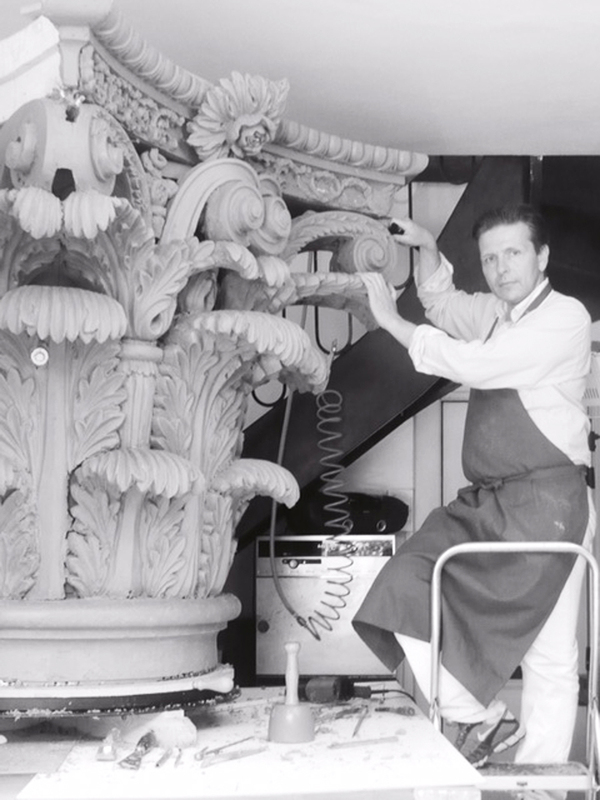 I actually worked with Bernhard once on the new palace in Berlin – just for one summer, after an exhibition, I took three months out and worked with him, carving a huge capital for one of the columns in the palace – so I’m slightly closer to the material creation of the frame than you might think. I guess I’m there, learning. It informs the way I do things; being so close to the actual process of making allows me to have more knowledge on which to base what I might want to do, and how I might want to tinker with the norm. JW: When you put a work of art in a frame – and I suppose that you’ve first tried it out in a mock-up – does it give you a sense of distance? – do you feel that you, as the creator, are looking at the work differently? MA: I think that a work only feels finished for me when it is actually in a frame. I’m well aware that Old Master paintings are reframed, and occasionally taken out of their frames altogether; they may seem improved by this to some, I suppose, and people have in fact sometimes said that my own pictures, too, when taken out of their frames, also seem improved. 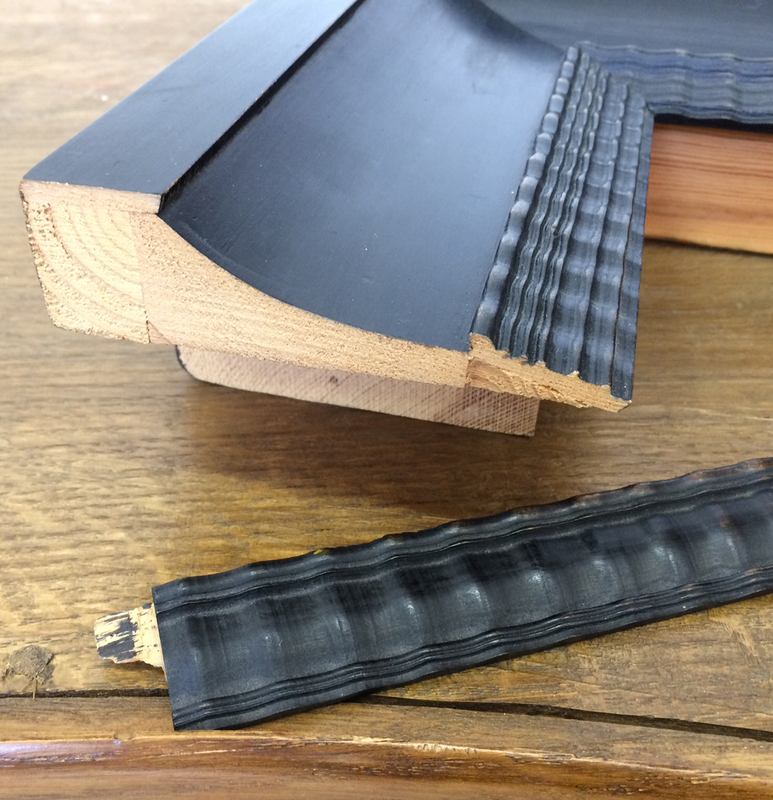 There’s a danger when you’re framing something that the final effect may not be quite what you were expecting; and by the time you’ve finished then – especially if it’s a fairly substantial frame – obviously you are to some extent committed. I think the benefits do usually outweigh the disadvantages, however, and if all else fails, the picture can always be removed from the frame. Yeah – I do feel that, as the creator, I am looking at the work differently when it’s in a frame. In some instances, it may be the first time that I’m actually looking at the work of art as a whole, and the frame can give me enough distance to look at the work clearly. Perhaps that doesn’t answer the question: I may not feel the painting is successful, even when it’s in a frame, but framing it allows me to make that judgement. And the question I always ask the craftsman when one of these frames is finished is, how long will one of these frames last? 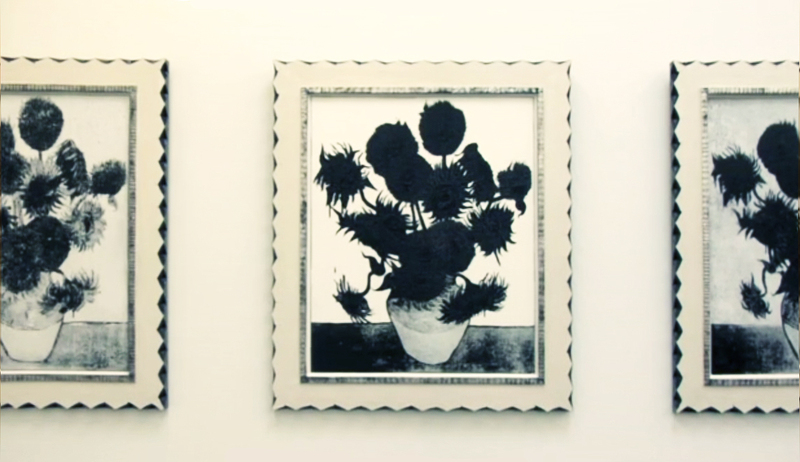 The Frame Blog: I wondered whether you might like to say something more about the frames on the black sunflowers, which you show as a complete series on exhibition. They seem to have had the zigzag contour cut out in such a way as to give them a kind of folk-art feeling, and also to have a ripple moulding (as in Netherlandish and German frames) at the sight edge. Is this something to do with Provence, where the originals were painted, and with Van Gogh’s nationality respectively? – or is it purely visual? 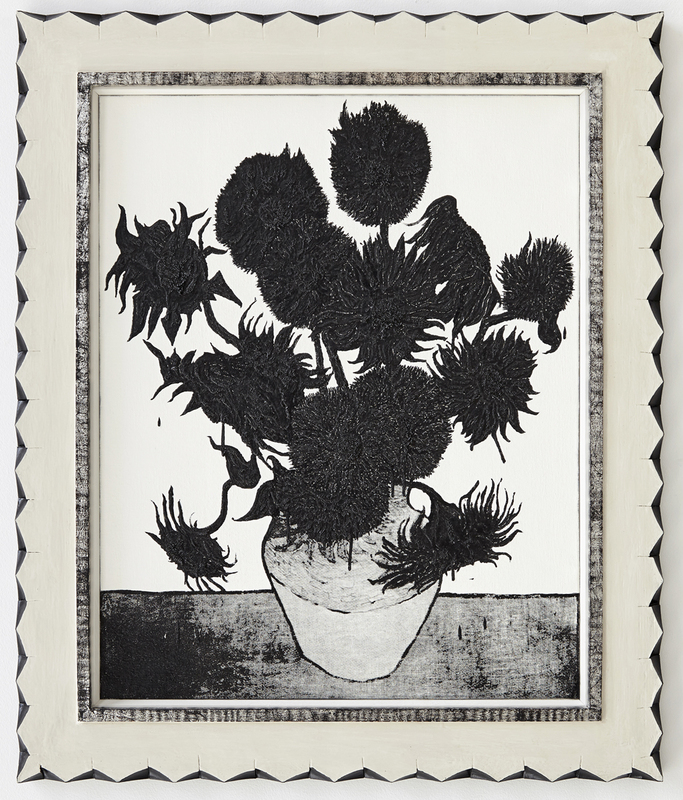 Mark Alexander: The sunflowers originated at the same period as the giant screenprints (the Shield of Achilles series). I had mixed up huge quantity of paint to make the latter, and one day I noticed that a splash on the floor had wrinkled and looked like a burnt sunflower; and then I thought that – as the pursuit of this sun-like image has for the second time brought me almost to ruin, like a sunflower turning its head to follow the path of the sun – perhaps these painted sunflowers had similarly been burned up by my ego: by following its destructive path. 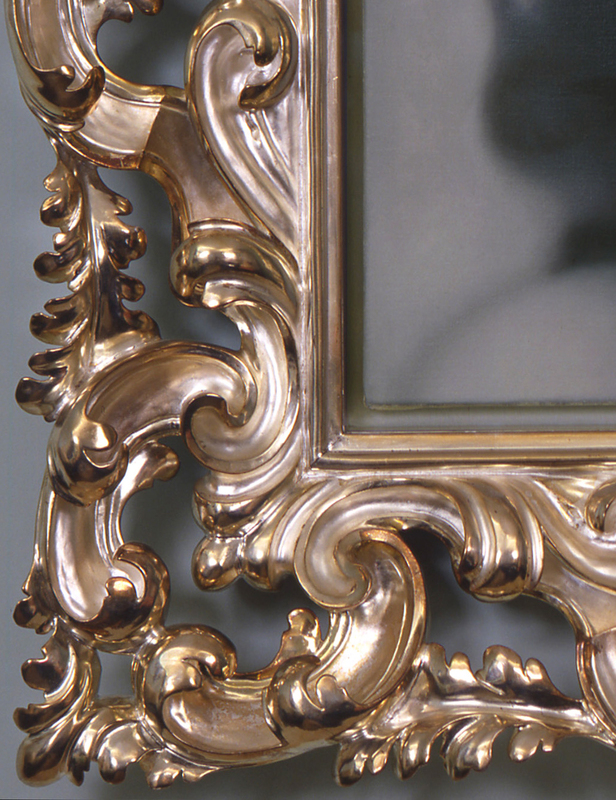 The motif along the sides of the frames came from the diamond-shape of a sunflower petal. These frames were made by Udo Arnold from Berlin; he is one of the really great craftsmen – he designed the steel rings (see below), and has made a large number of other frames for me. The basic pattern for the sunflower frames is a Spanish 17th century style, carved from spruce and gessoed. However, the touch which transformed them lay in Udo’s understanding of how roughly-made these frames were originally – they’re just put together out of unplaned wood – and that they were also carved without much initial planning, so he never measured where to cut the zigzags – he just went for it… and, of course, that’s where the magic lies. 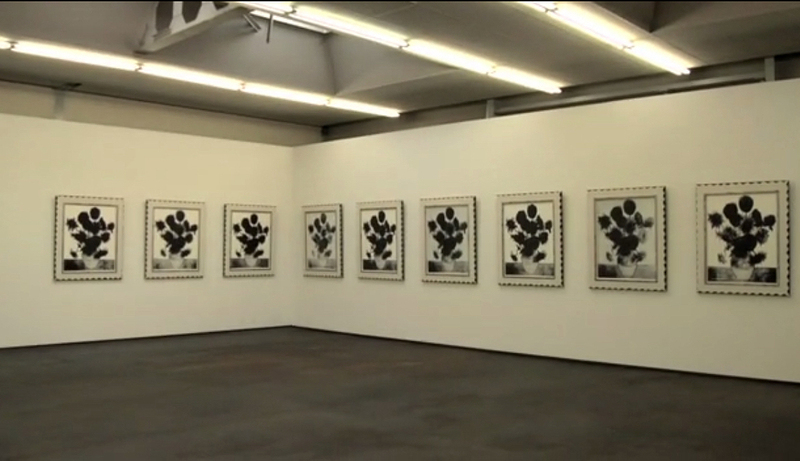 FB : With the Blacker Gachet series, is it an accident of the images that the frames of numbers IV, IX and VII look matte (or, at least, less shiny) compared with the others in the series, or is this intentional? Are the frames actually all identical, or do they vary very slightly, like the paintings? Where did you have them made, and would you like whichever craftsman it was mentioned, too? MA : There are thirteen of these frames, and they’re made of pearwood veneered onto a spruce carcase and ebonized. Udo Arnold made them; he built himself a mechanical wave-moulding machine, which can reproduce anything. 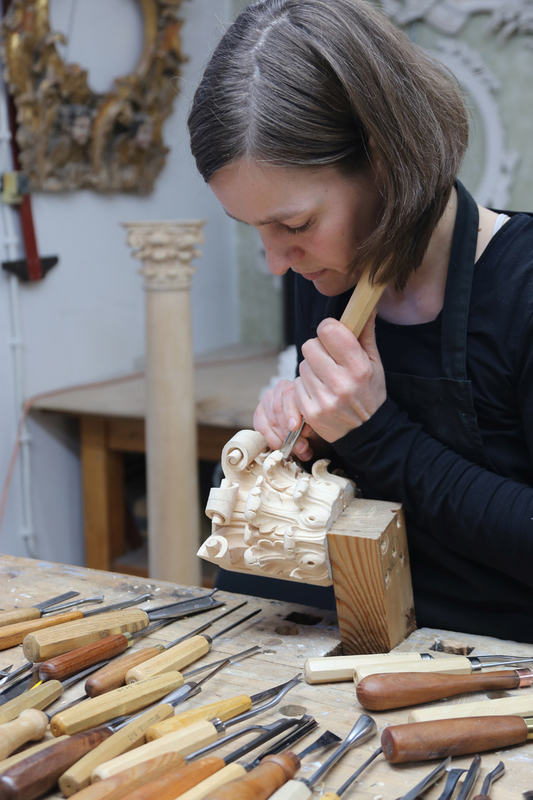 It has a big handle you turn, and if you take off too much wood you can get little flaws in the cut – and that’s the crucial trick – it makes the moulding look as though it’s three hundred years old, with the feel of a polished oryx horn. I think the reason some look more shiny than others is that some of them were ebonized in London, and photographed directly after. One of them has a slightly different wave moulding, and that one’s mine. A thing that I love about these frames is that the spruce carcase is constructed with lap joints, so on the finished frame you can see them at the sides, and as the wood shrinks they become more pronounced – lovely stuff. FB : And what about those frames in the exhibition of the Shield of Achilles screenprints? 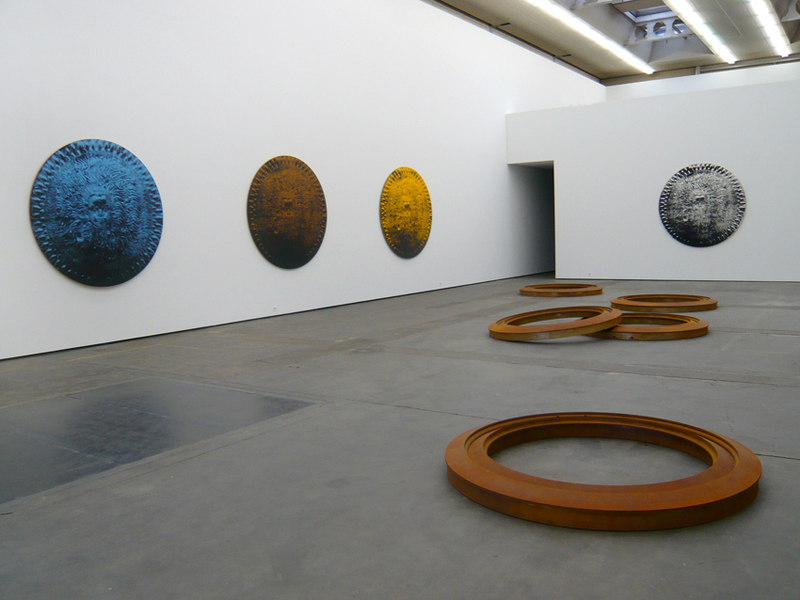 I was very struck by the huge round frames – what I would call tondo frames – lying on the floor in that installation. Andrew Graham-Dixon referred to them as ‘…rusty metal frames, which almost seems to be the discarded frames of the shields’ (I am paraphrasing). How did you come to pair these camera-like frames with the shields? MA : They are steel rings, and the wooden model for them was also made by Udo Arnold. 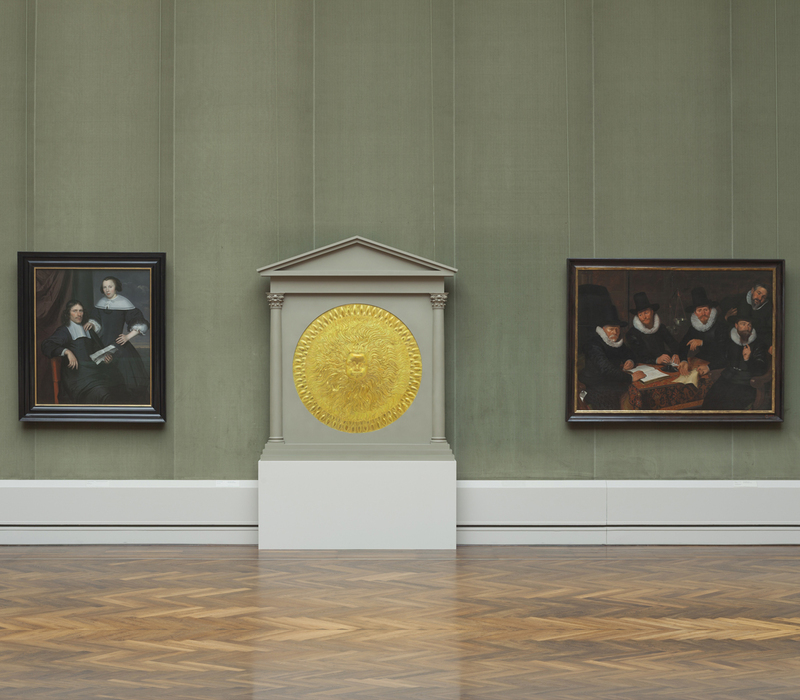 It was initially designed to house the golden painting – not the one now on exhibition in the Gemäldegalerie, but the first version, from years back; it was made of solid oak. We made several versions, but – as is my way – I planned the frame before I made the picture; and, as the early paintings were very delicate, this design was much too strong. It’s based on forms from early Minoan pottery. 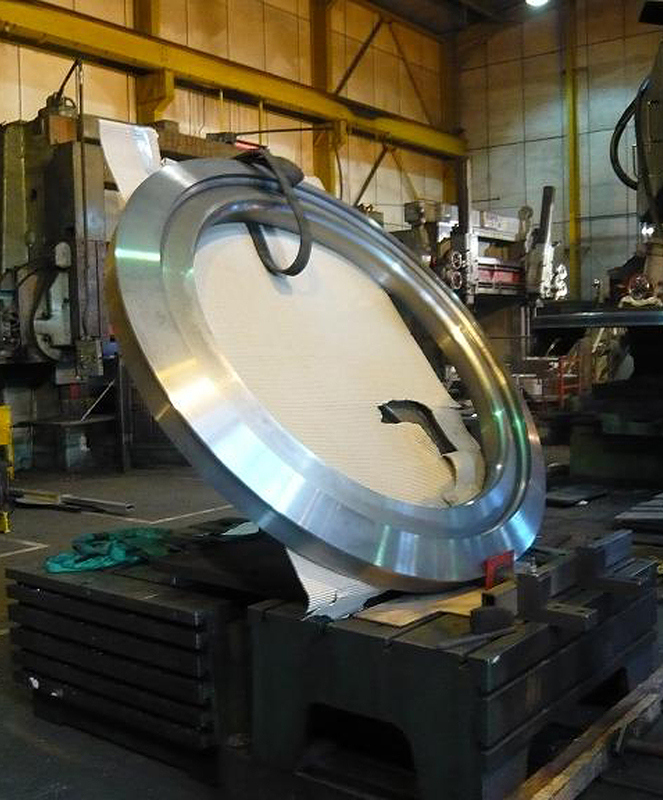 Five years later, I had this frame cast as five huge rings, made of COR-TEN steel alloy and weighing two tons each. 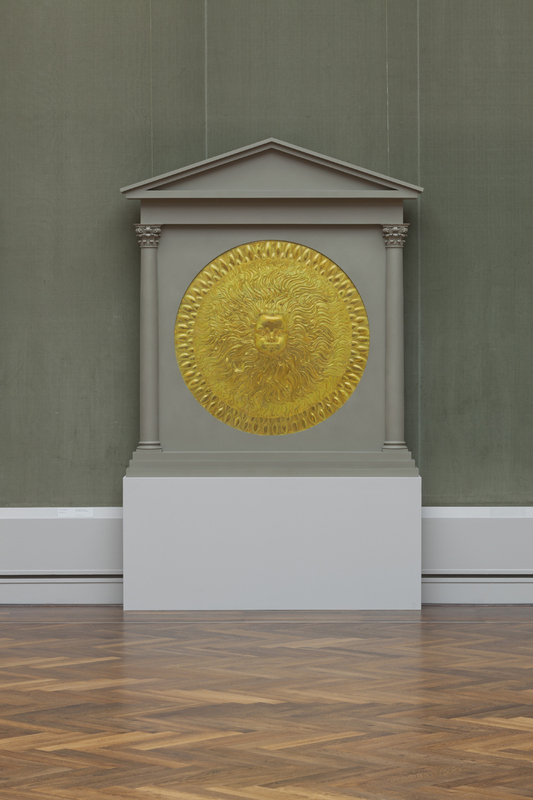 These were shown in Berlin at a point where the golden painting was still eluding me; so I made some giant screenprints (The Shield of Achilles series) out of my sun image. These are on heavy canvas and printed with oil paint which often caused the image to be quite faded, like a fluctuating radio signal. The giant rings also represented for me some kind of falling to earth; a failed project… The steel alloy is specifically designed to tarnish to an even rust-coloured surface, and will eventually turn the colour of a chocolate brownie, adding to the idea that, like a rocket, the lenses burned up on re-entry, or like Icarus, they were burnt by the sun and fell from the heavens. I got too close to my own dream – to the sun. 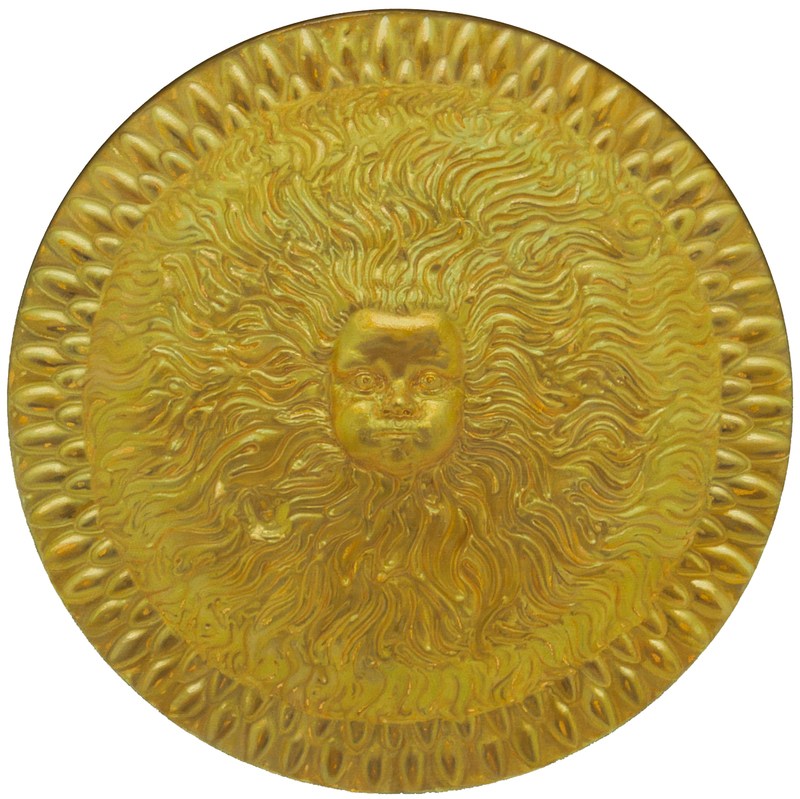 FB : The shields themselves seem to have integral frames, with the effect of a Renaissance giltwood tondo; the outer edge of each one has those overlapping petals or scales or egg-like forms, which seem to preclude any other added frame. MA : Well, I had an idea for an ornamental border of some sort for The golden wonder, and we may well have looked at some reference books; however, the way it came about was almost from necessity. 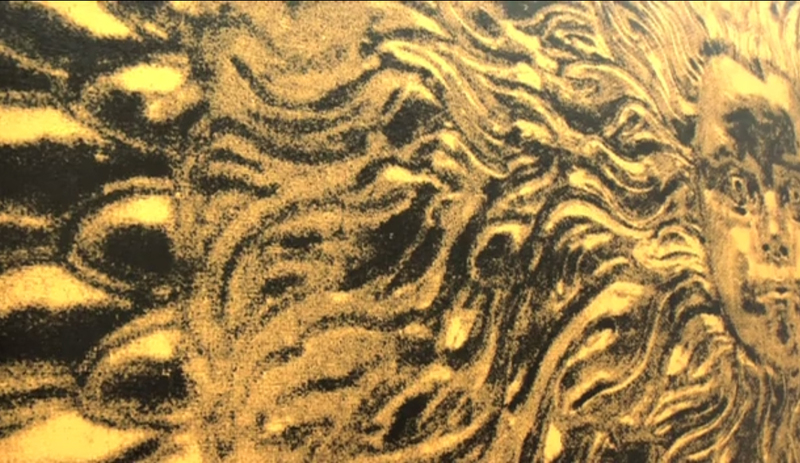 I wanted the model to resemble beaten gold, so the way the plasticine surface flowed over the model was critical. 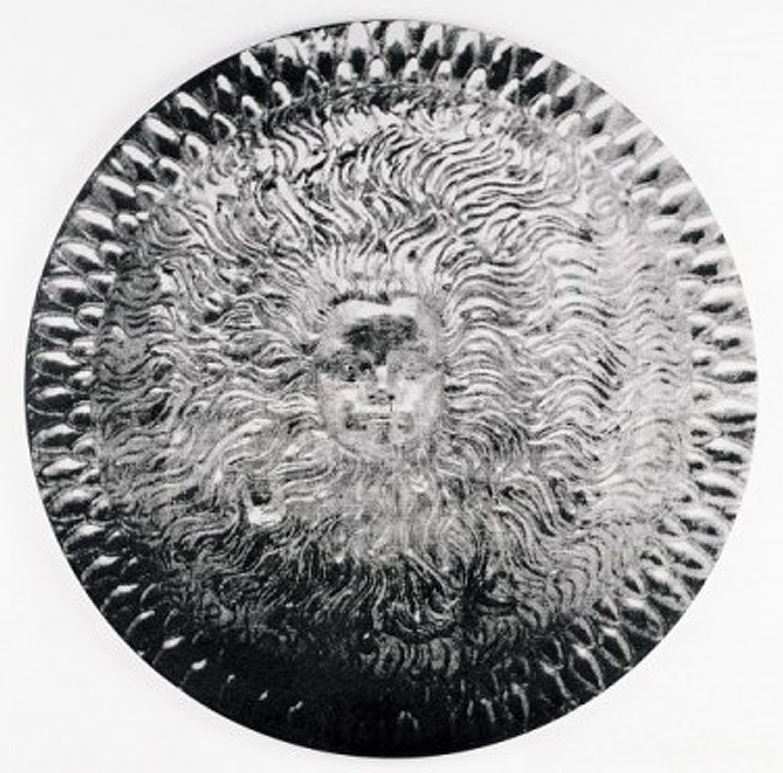 Bernhard carved a little mould in limewood of three of the leaves, and when I pressed the plasticine into the mould it mimicked the look of worked metal perfectly: it provided a strong decorative motif but also a subliminal message that this object was a beaten sheet of gold. With thanks to Mark Alexander for his time, and for all the images, and to Jack Wakefield for conducting such an interesting and revealing interview. Udo Arnold made The blacker Gachet frames, the models for the steel frames (God’s cosmic lenses) and the frames for the Via negativa series (the black sunflowers). Bernhard Lankers made the Baroque frame for Jasmin. Luise Harfmann made the frame for Wrestling with angels (The golden wonder) in the Gemäldegallerie.